Orem City Hall is located at 56 North State Street, Orem UT 84057; phone: 801-229-7999. Photo: David and Drusilla Baxter House, ca. 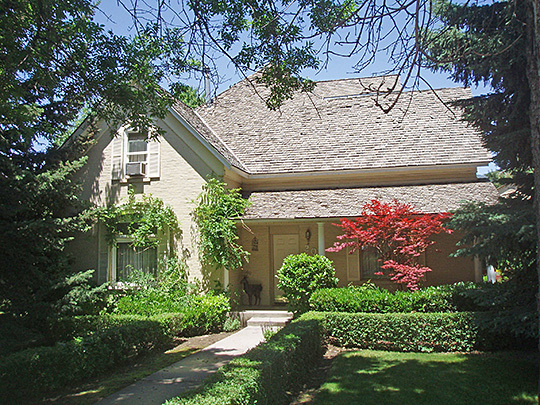 1895, 206 West 1600 North, Orem, UT. Listed on the National Register of Historic Places in 1998. Photographed by User:Ntsimp (own work), 2009, [cc0-by-1.0 (creativecommons.org/publicdomain/zero/1.0/deed.en], via Wikimedia Commons, accessed September, 2013. Orem, Utah, is located in the center of Utah County. The city extends from the eastern shore of Utah Lake, to Provo and the foothills of Mount Timpanogos. The community of Orem was originally called the "Provo Bench" area. Bypassed by the Provo River, the bench lands were barren and rocky, and considered uninhabitable, especially in winter. Beginning in 1858, small groups of settlers attempted to farm the area, but were mostly unsuccessful until the construction of the Provo Bench Canal in 1864. At this time, there were a few farms and orchards on the bench, but no full-time residents. As the canal construction expanded and irrigation improved during the last three decades of the nineteenth century, homesteaders began to build homes as well as plant fields and orchards. By the end of the nineteenth century, a population of 692 was living on the Provo Bench. Most early settlers were members of the Church of Jesus Christ of Latter-day Saints (LDS or Mormon Church). Unlike many early Utah settlements, Orem was not laid out in a grid pattern of city blocks, but as a string of homesteads along the territorial highway (now State Street) and other thoroughfares. Though these early farmers experimented with a variety of crops, fruit production proved to be the most lucrative cash crop. The first major peach crop, harvested in 1892, encouraged more settlement and agrarian expansion. In the 1890s, the small community had a sugar-molasses mill, two schoolhouses, an LDS Church meetinghouse, a blacksmith shop, a general store, and two recreational resorts. In 1910, with a population of just over a thousand, the community began to receive major improvements. Electricity reached the Provo Bench in 1912 from a power station in Provo Canyon. The construction of the Salt Lake and Utah Interurban Railroad, which stretched from Salt Lake City to Payson, gave the bench-area farmers access to a wider range of markets. In 1914 the Provo Bench Commercial Club was organized to promote better business conditions. The business leaders decided to change the area's name from Provo Bench to Orem, after Walter C. Orem the owner of the interurban railroad. The community was incorporated under the name of Orem in May 1919. The first act of the new town was the passing of a bond election in the amount of $110,000 to pay for a new culinary water system. Orem grew slowly, adding an average of 500 people each decade. By 1930, the population was 1,915. Agriculture continued to be the primary occupation for the majority of Orem citizens, though the economy had already began to stagnate and decline even before the depression years. Nevertheless, the town made gradually improvements during this period. State Street was paved with concrete in 1921. The entire community had electricity by the end of the 1920s. The town was enlarged by a series of annexations in the late 1930s. In 1938, the James G. Stratton farm and residence at the corner of State Street and Center Street were acquired, giving Orem its first official city center and town hall. One of the greatest achievements of the community was the establishment of the Sharon Cooperative Educational and Recreational Association (SCERA) in 1933. Though still primarily an agricultural community, by 1940 Orem had a street numbering system, a thriving commercial district along State Street (necessitating the installation of semaphores at 800 North and 800 South), and a population of 2,914. The impact of World War II on Orem's history was tremendous. The Geneva Steel Plant was built in 1942 and Orem's population increased by 186%. Six subdivisions were plated in 1943 for defense worker housing, and the city began to be transformed from an agricultural village to an industrial center. More subdivisions and a large shopping mall followed in the decades between the 1950s and the 1970s, and Orem City became the commercial center of Utah County. Beginning in the 1980s and continuing to the present, computer-related industries have generated even more suburban development. Today the vestiges of the early agricultural community are rapidly disappearing. Because of heavy commercial and residential development, very few examples of the historic architecture remain, making the few extant historic buildings even more important. National Register nomination document, 1999, prepared by Korral Brochinsky, City of Orem Historic Preservation Commission, Adams, George and Temperance House, National Park Service, National Register of Historic Places, Washington, D.C.